Stimulates cells encouraging new hair growth. Proven effective in clinical trials, this comb’s low-level laser technology and high-tech LED light stimulate cells that encourage hair growth! Simply comb ... this breakthrough treatment also reduces effects of hormones that deprive hair follicles of nutrients essential for healthy growth. No pain, no hassle, no chemicals ... safe, therapeutic light increases hair’s protein synthesis, improves cell growth capacity and increases blood circulation, resulting in thicker, fuller, healthier hair. Uses 2 AA batteries (not included). Just 3 times a week, comb your hair with Grande Hair Stimulating Laser Comb for 10-15 minutes each time. In 2-4 months, you will enjoy the apperance of fuller, thicker and healthier looking hair. The GrandeHAIR Stimulating Laser Comb uses the most advanced low level laser technology (LLLT) and Hi-tech LED available to stimulate cell metabolism and reduces the harmful effects of dihydrotestosterone (DHT), which has been known to bind to hair follicles depriving them of necessary nutrients that are needed to survive. The low level laser light in the Grande HAIR Stimulating Laser Comb has been found to help new hair growth. This process is called “photobiostimulation” (PBS). 4. Increased blood circulation due to the dilation effect on capillaries. This product does work but it's important to read the "usage" instructions and follow them; some people should NOT use this product as noted in instructions. Of course, you have to be very patient to see any results (it's hard to wait)...but you will see new hair. Using it with minoxidil also helps speed along the process. The only remark I have as a negative is: if you have a sensitive scalp, as I do, the comb points can be uncomfortable, especially since you have to use the comb for 10 - 15 minutes at a time; fortunately, it only has to be done 3 times a week. Also, the results are not permanent unless you use it consistently...and there does come a time when the hair that has grown in will reach a "plateau" and not grow any further. The hair on my scalp is still very fine, but it really helps to mask the see-through areas. I purchased to reduce hair loss. --my hair is too too thin, I hope this will help!---let everyone know....later. I'm curious to know if it works accordingly. I saw the device on Dr. Oz, intriguing! My hair is thinning, willing to try this, hope it works. I have thinning hair and since it has been approved by the FDA I thought I would try it. Who should not use this brush? BEST ANSWER: Thank you for your question. The GrandeHAIR Laser Comb should not be used by those who have high blood pressure, are pregnant, undergoing chemotherapy or have metal implants in their head. We hope this information will be of help to you. Since this takes 2-4 months to work is there extended return policy? BEST ANSWER: Thank you for your question. No, our return policy is the same for all of our items.We hope this information will be of help to you. Is this granteed to thicken hair? BEST ANSWER: Thank you for your question. The Grande Hair Laser Comb is made to help new hair growth. It can help thicken hair with the new hair growth. We hope this information will be of help to you. No, it did not work.. Not strong enough to help.. I only used it once, so I can't really say. BEST ANSWER: I'd say a definite no. 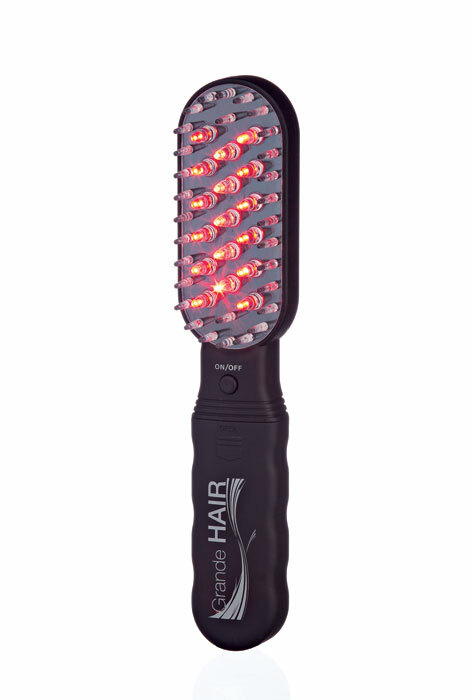 I just turned 70 and was 68 or more when I began using the hair laser comb. I don't know what it does but my hair looks fuller and more full of body. I hope you get the same results and can't think of any reason why you shouldn't. Best of luck. No, age does not matter just be consistent!!! Will it work for someone with alopecia? BEST ANSWER: Thank you for your question. Unfortunately this will not work for alopecia. We hope this information will be of help to you. will it work for older people? BEST ANSWER: Absolutely! I'm 68 and it has worked wonders. My hairdresser is amazed and is even ordering one for her husband.